09:58 am - Vatican City. 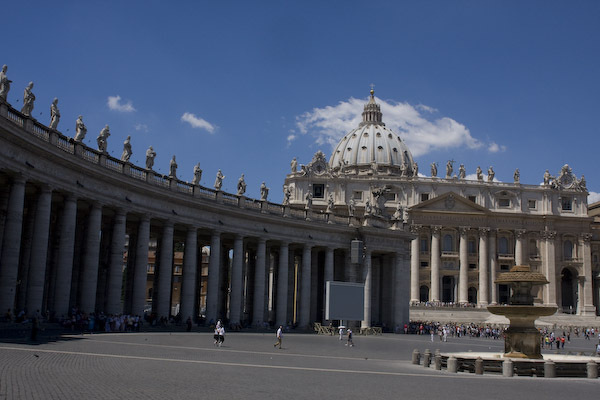 Photos from Vatican City. Nothing terribly impressive as far as photographs go, but I must say that the Vatican proved to be far more awe inspiring than I expected it to be. I've seen a lot of photos of St. Peter's Basilica but none of them (including those I've taken) convey just how large it is. In photos it looks like every other Renaissance cathedral - in person it's no different, only you feel as though you've been shrunk to 1/3rd your height. 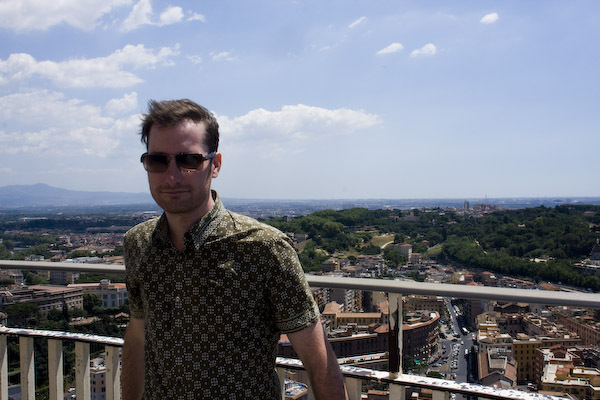 Seeing St. Peter's Basilica is free, but you pay 5 Euro extra for the privilege of hiking to the top. We did. A few hundred steps later we found ourselves on a thin ledge inside Michelangelo's dome - a couple hundred feet above the floor of the cathedral. Since I'm afraid of heights, though, and Katie's claustrophobic, we decided to keep climbing to the very top of the cathedral. The route takes you through tunnels inside the dome - meaning that as you climb, the walls start to bend. 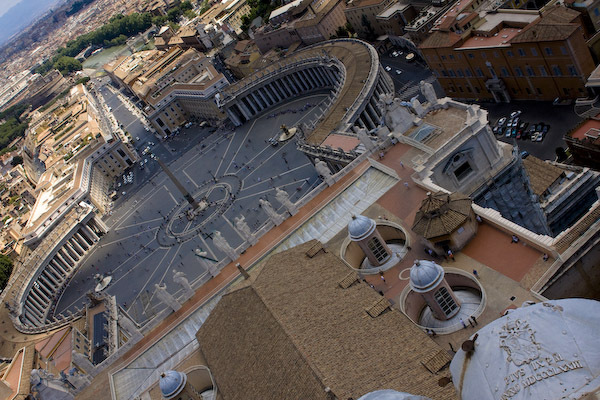 Once you reach the top, however, you get a fantastic view of Rome. The photo of me is from this vantage point - if I look uncomfortable, it's because I am. We also visited the Vatican Museums, which require something like four miles of walking to take in. They're overwhelming, especially after a week in Rome. We didn't take many photos, although Katie and I were most impressed with the painting gallery as well as the early Christian art - although I found the organization confusing as it was grouped by religious significance as opposed to artistic movement. Go figure. This set also includes photos of Bernini's Ectasy of St. Teresa, tucked away in a corner of Santa Maria della Vittora and almost missed due to its omission from most of our tour books (one contained a footnote to it in a foreword). This church also contained my favorite Holy Relic as well as my favorite piece of Religious Kitsch. Yeah, I think there are three of them. Maggorie, though, is particularly impressive - a really beautiful and daunting church. Incidentally. I actually have more of this church, but apparently neglected to tag them properly. Super cool! Scott has a big fat book he bought in Rome with pictures of all of the artwork in the church for his research. I want to dig it out now! I like that the relic is on casters! You can wheel it out the back really quick like, and bring home skulls to display in your own home. That's totally what I was thinking. I want to gank those for decor at my house.